Neurologists are finding new ways to wake patients up from comas via cortical stimulation and sleeping pills like Ambien. New discoveries in brain activity are revolutionizing coma treatment. The patient in the top image could no longer move or speak. To respond no, he was asked to imagine visiting his apartment; to respond yes, to imagine playing tennis. When asked a no question, his brain regions for spacial navigation lit up exactly as in a normal subject. Courtesy of Viking. Reprinted with permission from the Massachusetts Medical Society. This article is excerpted from Consciousness and the Brain: Deciphering How the Brain Codes Our Thoughts by Stanislas Dahaene, out now from Viking. Every year, an awful number of car crashes, strokes, failed suicides, carbon monoxide poisonings, and drowning accidents leave adults and children dramatically crippled. Comatose and quadriplegic, unable to move and speak, they seem to have lost the very spark of mental life. And yet deep inside, consciousness may still linger. In The Count of Monte Cristo, Alexandre Dumas painted a dramatic picture of how an intact consciousness may be buried alive inside the tomb of a paralyzed body. Monsieur Noirtier is a fictional character—probably the first literary description of a locked-in syndrome. His medical condition, however, is all too real. Jean-Dominique Bauby, the editor of the French fashion magazine Elle, was only 43 when his life took a dramatic turn. On Dec. 8, 1995, a stroke plunged Bauby into a 20-day coma. He awakened to find himself in a hospital ward, fully paralyzed except for one eye and part of his head. He survived for 15 months, enough time to conceive, memorize, dictate, and publish an entire book, one character at a time by blinking his left eyelid. In 2006, the subdivision of noncommunicative patients into coma, vegetative, minimally conscious, and locked-in states seemed well established when a shocking report, published in the prestigious journal Science, suddenly shattered the clinical consensus. The British neuroscientist Adrian Owen described a patient who showed all the clinical signs of a vegetative state but whose brain activity suggested a considerable degree of consciousness. Horrifyingly, the report implied the existence of patients in a state worse than the usual locked-in syndrome: conscious but without any means of expressing it to the outside world, not even through the batting of an eyelid. While demolishing established clinical rules, this research also carried a message of hope: brain imaging was now sensitive enough to detect the presence of a conscious mind and even to reconnect it with the outside world. Even in patients with a long history of a vegetative state or minimal consciousness, the brain remains plastic, and spontaneous recovery can never be excluded. Indeed, strange reports of sudden remissions abound in medical records. One man remained in a minimally conscious state for 19 years, then suddenly recovered language and memory. Images of his brain, created using the technique of diffusion tensor imaging, suggested that several of his long-distance brain connections had slowly regrown. 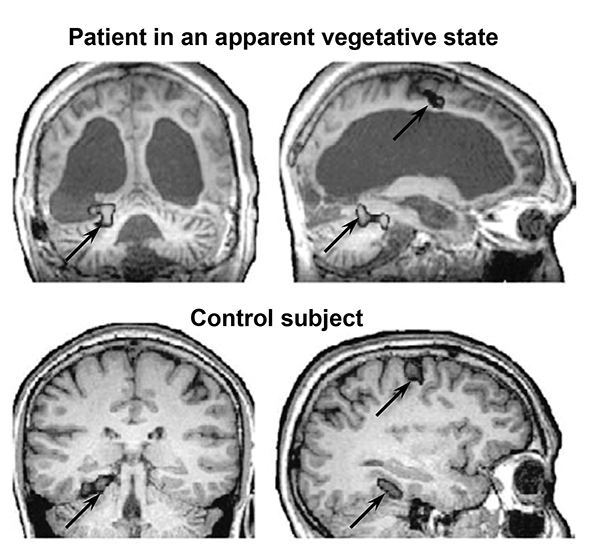 In another patient, communication between the frontal cortex and the thalamus had been depressed when he was vegetative, but it returned to normal after he spontaneously recovered. We do not expect such a recovery to be possible in every patient—but can we understand why some patients recover while others don’t? Clearly, if too many of the prefrontal cortex neurons are dead, no amount of stimulation will revive them. In some cases, however, the neurons are intact but have lost many of their connections. In yet others, the dynamics of brain circuits seem to be the culprit: although connections are still present, the circulating information no longer suffices to maintain a sustained state of activity, and the brain switches itself down. If the circuit is sufficiently spared to be switched back on, such patients may exhibit a surprisingly fast recovery. But how can we flip the cortical switch back to the “on” position? Pharmacological agents that act on the dopamine circuits of the brain are prime candidates. Dopamine is a neurotransmitter that is primarily involved in the brain’s reward circuits. Neurons that use dopamine send massive modulatory projections to the prefrontal cortex and the deep gray nuclei that control our voluntary actions; it may help them restore a normal level of arousal. Indeed, three patients in a persistent vegetative state suddenly regained consciousness after administration of a drug called levodopa, a chemical precursor of dopamine that is typically given to Parkinsonian patients. Amandatine is another stimulant of the dopamine system that, in controlled clinical tests, has been found to slightly speed up the recovery of vegetative and minimally conscious patients. Other cases on record are much stranger. Most paradoxical is the effect of Ambien, a sleeping pill that, bizarrely, may revive consciousness. One patient had been totally mute and immobile for months, in a neurological syndrome called “akinetic mutism.” To ease his sleep, he was given a pill of Ambien, a well-known hypnotic—and all of a sudden he awoke, moved, and began to speak. In another case, a woman who had suffered a left-hemispheric stroke and was dramatically aphasic, unable to say more than the occasional random syllable, was also prescribed Ambien because she had trouble falling asleep. The first time she took it, she immediately resumed speaking for a few hours. She could answer questions, count, and even name objects. She then fell asleep, and sure enough, the next morning her aphasia had returned. The phenomenon repeated every evening, whenever her family gave her the sleeping pill. Not only did it fail to put her to sleep; it had the paradoxical effect of reawakening her dormant cortical circuitry for language. These phenomena are only beginning to receive an explanation. They seem to arise from the multiple loops that link the cortical workspace network, the thalamus, and two of the basal ganglia (the striatum and the pallidum). Via these loops, the cortex can indirectly excite itself, as activation propagates in a circular path from frontal cortex to striatum, pallidum, thalamus, and back to cortex. However, two of these connections rely on inhibition rather than excitation: the striatum inhibits the pallidum, and the pallidum in turn inhibits the thalamus. When the brain loses its oxygen supply, the inhibitory cells of the striatum seem to be among the first to suffer. As a result, the pallidum is insufficiently inhibited. Its activity is free to shoot up, thus shutting down the thalamus and the cortex and preventing them from sustaining any conscious activity. These pathways are still largely intact, however; they are only massively inhibited. They can be switched back on by inserting a circuit breaker into this vicious circle. Many solutions seem to be available. An electrode that is planted deep in the thalamus may counteract the excessive inhibition of thalamic neurons and thus switch them on again. Alternatively, dopamine or amantadine may be used to excite the cortex, either directly or through the remaining neurons in the striatum. Finally, a drug such as Ambien may inhibit the inhibition: by binding to the many inhibitory receptors in the pallidum, it forces its overexcited inhibitory cells to switch off, thus releasing the cortex and thalamus from their unwanted quiescence. All these mechanisms, although still hypothetical, may explain why these drugs have similar effects in the end: They all bring cortical activity closer to its normal level. The above tricks will work only if the cortex itself is not exceedingly damaged. A favorable sign is when the prefrontal cortex seems intact on an anatomical image yet shows a dramatically reduced metabolism; the cortex may have been simply switched off and may be reawakened. Once it is switched on, it will slowly return to a self-regulating state. In their normal range of operation, many of the brain’s synapses are plastic and can increase their weight to help stabilize the active neuronal assemblies. Thanks to such brain plasticity, a patient’s workspace connections may progressively gain strength and become increasingly able to sustain a durable state of conscious activity. Even for patients whose cortical circuits have been damaged, we may envisage futuristic solutions. If the workspace hypothesis is correct, consciousness is nothing but the flexible circulation of information within a dense switchboard of cortical neurons. Is it too far-fetched to imagine that some of its nodes and connections might be replaced by external loops? Brain-computer interfaces, particularly using implanted devices, have the potential to restore long-distance communication in the brain. We will soon be able to collect spontaneous brain discharges in the prefrontal or premotor cortex and play them back to other distant regions—either directly in the form of electrical discharges, or perhaps more simply by recoding them into visual or auditory signals. Such sensory substitution is already used to make the blind “see” by training them to recognize audio signals that encrypt the image from a video camera. Following the same principle, sensory substitution could help reconnect the brain with itself, restoring a denser form of inner communication. Denser loops may provide the brain with the critical amount of self-excitation needed to maintain an active state and remain conscious. Time will tell whether this idea is far-fetched. What is certain is that, in the next decades, the renewed interest in coma and vegetative states, based on an increasingly solid theory of how neuronal circuits engender conscious states, will lead to massive improvements in medical care. We are in for a revolution in the treatment of disorders of consciousness. This article is excerpted from Consciousness and the Brain: Deciphering How the Brain Codes Our Thoughts by Stanislas Dahaene. Reprinted by arrangement with Viking, a member of Penguin Group (USA) LLC. Copyright © 2014 by Stanislas Dahaene.